She looks pretty good for her age! Custom-built in 1964 by Mr. Fruge, and designed by my Dad. I always remember Dad saying "solid brick" as opposed to brick veneer, but that's just my recollection. 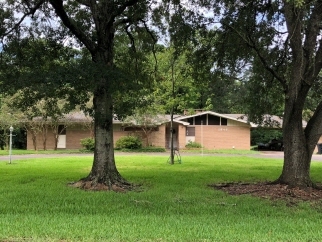 This is a unique property, as it is on an acre of land in the heart of Port Neches. 4/2.5/2cp with spacious rooms, and ample closet space. The home has a living room, which is plenty big for a table, if you don't use the double-sided bar as we did. The living room has a brick wall all along the back side of the house, which has a fireplace and inset for a television. There is also a music room (as we called it), plus a study. Extra storage closets under carport, workshop on slab with 1/2 bath, plus a greenhouse. Large wooden deck out back, which has a built-in brick grill area. There is also a water well for your gardening needs. Update this one and you'll have a real gem!